The objective? To arrange the books so that the top shelf is perfectly level. But you can only use certain books, in certain orientations, with a minimum of 2 books touching the top shelf at any time. Oh, and leave some room for a little black cat! 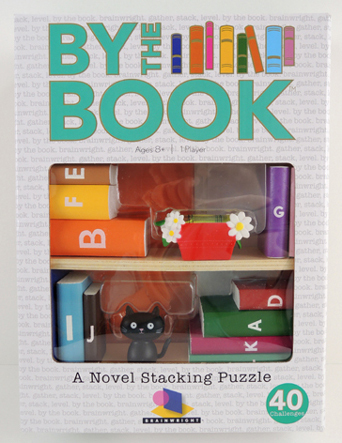 Today, I’m reviewing By The Book, a stacking puzzle for ages 8+ (Brainwright, $18). 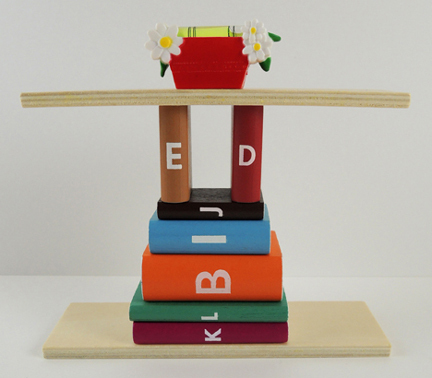 The game consists of 40 challenge cards, 12 wooden books, 2 wooden shelves, 1 plastic cat, and 1 balance level made to look like an adorable red flower pot. 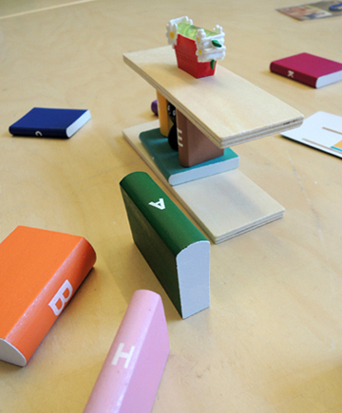 Once you’ve gathered all the relevant pieces, lay the bottom shelf on a level surface, then try configuring the books to the card’s specifications. Put the top shelf in place when you think you’re done, then place the balance level on top to see if your solution measures up. And remember – a minimum of 2 books much be touching the top shelf at any time. If your solution passes the level test, flip the card over to see if matches the official solution (and the rules do mention there may be other ways to solve the challenge). Some of the solutions, however, are not what you expect! Look at this creative configuration! When playing this game, it’s important to work on a level surface. If your work table is tilted, you’ll never reach a solution. So use the level to make doubly sure you’re nice and even before you start playing. So, what did our kid testers (ages 6, 8, and 10) think of By The Book? They loved it! The game requires analysis, trial & error, testing, and re-testing, but it’s very calm, non-competitive, and you can take as long as you like to reach the solution. 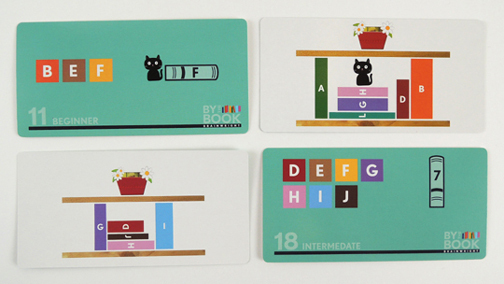 By The Book is labeled as a 1 player game, but our kid testers found ways to collaborate. 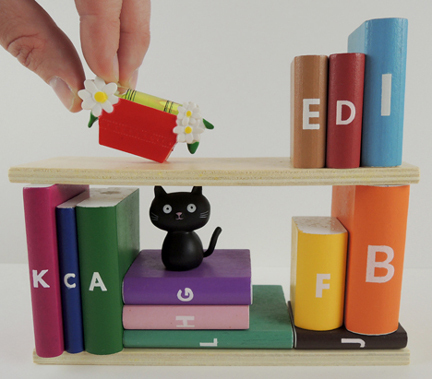 The cat adds a nice touch, and the kid tester found it very satisfying to put the level on the top shelf to see if their clever arranging worked! By The Book is the best (a “bestseller,” if you will). It’s fun, intelligent, works with a large age range of kids, and the pieces are really nice quality. This would be a terrific classroom chill-out activity, the perfect addition to library game nights, or an awesome gift from that super cool librarian aunt or uncle. Plus, it comes with a CAT! Five out of five stars.